A pinched nerve can cause a significant amount of neck pain, along with discomfort that radiates to other areas of the body. This can create major problems with your daily functioning, making it difficult to complete even simple tasks. In many cases, physical therapy in White Plains and the surrounding areas can help you alleviate this pain as your pinched nerve heals. 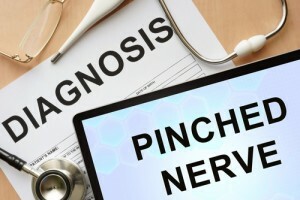 A pinched nerve can occur in a variety of situations. In general, this issue is primarily caused by an increase in pressure surrounding the nerve. In many cases, this is caused by repetitive motion or is due to being in the same position for too long. It can also occur as the result of an accident. Seeking the help of aWestchester County, NY, physical therapist will help you alleviate the pain while you wait for the pinched nerve to heal. A physical therapist can help with a pinched nerve diagnosis. Pain Management – The neck pain associated with a pinched nerve may be minor or it could be severe. Your physical therapist will help you determine the best way to manage your pain. Manual Therapy – Manual techniques can help relieve the pressure surrounding the nerve, which will eliminate the pain. Massage can also be used to relax muscles in the area. Range-of-Motion Exercises – Because a pinched nerve can occur from staying in one position for long periods of time, range-of-motion exercises may be used to eliminate pressure. Posture Education – Your posture can play a role in whether you are susceptible to pinched nerves. Your Westchester County, NY, physical therapist will promote good posture techniques to resolve your pain. Strengthening Exercises – Proper muscle support can reduce the amount of pressure placed on nerves. For this reason, you may be assigned strengthening exercises. When your neck pain is caused by pinched nerves, it’s important to seek physical therapy in White Plains and the surrounding areas. They can provide the treatment options you need to feel better and eliminate the pain so you can continue to complete your daily tasks with ease and less discomfort. If you need a Westchester County, NY, physical therapist to help eliminate your neck pain, contact us. Our experienced therapists can provide relief from your pinched nerve.